As I start looking at Rerum Novarum, Pope Leo XIII’s famous 1891 encyclical, I’ll first summarize/paraphrase what the encyclical says, paragraph by paragraph, then analyze the way Pope Leo presents his argument, and finally offer my own commentary on it. The first two focus on what is being said, and the last is my own personal response to it. This is a method I recommend to anyone who wants to give an important work a fair reading — in fact, it’s something that I have always tried to teach my students: understand first, and withhold judgment until you are sure you really do understand. This is the whole idea behind the 4-step method of reading with understanding that I’ve propounded elsewhere on this blog. Why start with summary? Because it forces me to boil down the argument to its essential parts — but I don’t want to oversimplify it, so sometimes my “summary” is really more of a paraphrase. I don’t want to skip over any really essential ideas. If you try this yourself, you’ll find that putting something (accurately) into your own words is a great exercise, one that forces you to think about what has really been said and also helps you to remember it in detail afterward, as well as come to grips with the claims being made, and their importance. In other words, it helps you to “read, mark, learn, and inwardly digest” the material (as an old Anglican collect says we should do with Scripture). So don’t rely on my summaries — they are no substitute for reading the document, but you may find that they help you understand it. My analysis is intended to help you see how the logic of Leo’s argument fits together — we need to understand not only what he is saying, but also why he is saying it that way, and not some other. Doing this allows us to see how the argument unfolds and avoid skipping over points that may seem insignificant at the time, so that by the time we reach the end we can see how the whole thing hangs together. The commentary I offer is meant to stir up your own minds, to get you thinking about the implications of what Leo is saying. I think you’ll find that, as we go along, there are lots of ways Rerum Novarum sheds new light on the problems and challenges of our own day, even though the world of 2015 is quite different than that of the 1890s. Much has changed, but human nature remains the same. We still have a lot to learn from this encyclical. By the way, although I had originally intended simply to republish here the work I had already published on the other blog, in fact I’m doing completely fresh summary, analysis, and commentary. You might find it interesting to compare the new version with the original — I expect somethings will look a bit different to me, three years after I first took a serious look at this encyclical. As we go along, I’ll use for reference the paragraph numbers that appear in the English translation that appears on the Vatican website. Not all translations use these numbers (the Latin original does not, and the English version on the New Advent site numbers them differently), but hopefully these numbers will allow you to follow along using whichever version you prefer. Any subheadings in the summary are my own invention, to show how the argument is structured. Today we’re looking at the first eleven paragraphs (1-17 in the New Advent translation), which begin to lay the foundation upon which Leo will build. “rights and duties of capital and labor,” Leo lays a foundation for his argument. 1. The passion for revolution, both political and economic, has resulted in a host of new evils, widening the gap between the rich and the working poor, and even causing a general decline in morals. Things have gotten so bad that these problems are preying on everyone’s minds, especially those in a position to regulate them. 2. Since I [i.e., Leo] have already written encyclicals on similar topics touching on the political sphere, I thought it would be appropriate now to write something concerning the condition of workers, in order to refute false teaching and clarify the principles that should guide any actions in this matter, so that just reason should prevail over political rhetoric. Because it is such a tricky question, many rabble-rousers have been confusing ordinary workers in order to lead them astray for their own dastardly purposes. 3. One thing we all should agree on is the fact that something needs to be done about working conditions. In the 18th century, the medieval trade guilds were finally abandoned, and the world itself seems to have abandoned any Christian social principles, leaving workers unprotected. The wealthy few, ruled by greed, now own everything, including the usurious institutions that now have turned workers, who own nothing, into wage slaves. 4. The socialists say that the way to fix this is to do away altogether with private property, and let the State hold everything in trust for everyone, so that everyone can have an equal share. There are two things wrong with this “solution,” though: first, if no one can own anything, the workers will be even more wretched than they already are; second, to do away with private property robbing from those who currently are property owners, itself an immoral and unjust act, and cause social and political chaos. 5. The reason people work for pay is to provide for themselves and their families — whether they use that pay for their immediate needs or, through thrift, manage to save some of it to buy property and other durable goods. Therefore, property is something a man has earned through his own efforts, the fruit of his toil, and truly his own possession by right. The socialists, in doing away with private property, thus harm the worker by robbing him of the just fruit of his toil and denying him the right to dispose of it as he sees fit. This is completely unjust, it violates the natural right to own property. 6. Man shares other animals’ instincts for self-preservation and the propagation of his species, both of which can be achieved using resources immediately at hand. But the very thing that distinguishes Man, his faculty of Reason, gives Man the right, peculiar to his race alone, to own things not just for the moment but over the long term. 7. This becomes even clearer if we take a closer look at human nature. Because Man’s faculty of reason allows to understand many things, including the implications for the future of actions taken in the present, Man rules himself (under the providence of God) by the rational choices he makes, both with respect to his present needs and to those that will recur in the future. And since man’s needs recur, Nature provides a resource to supply those needs — the earth itself, with the abundance it provides. And since Man provided for his own needs long before there was any State, there really is no need for the State to provide for him. 8. Acknowledging that God gave the earth for the use of all mankind is not to say that He intended us to possess it collectively; it simply means that He did not designate particular men to own it. He leaves this to human enterprise to work out. Even when the earth is parceled out to particular private owners, it still serves the needs of all, since those who are not landowners nevertheless procure the fruits of the earth with the wages earned as remuneration for their labor. Thus private ownership of property does not interfere with anyone’s opportunity to enjoy the fruits of that property. 9. Thus it is clear that private ownership of the land follows the law of nature. Land is most fruitful when man cultivates it by means of his own ingenuity and toil; when he does so, he truly makes the land his own, and it is only just that he should, in fact, own it. 10. Amazingly there are those who deny the logic of this, so obvious as to be virtually self-evident, and instead attempt to revive outmoded theories, allowing that men may use the earth and its fruits but not possess it. They can’t see that in asserting this they rob a man of the just fruits of his labor, namely all the improvements he has made to the land. Where is the justice in allowing him to toil and then giving the fruits of his toil to others? 11. So it makes sense that by and large, contrary to what these dissenters claim, humankind everywhere, throughout history, has acknowledged what natural law argues: that private property is in accord with human nature and provides for a peaceful common life. All just civil law agrees. And divine law concurs, for it severely forbids coveting what belongs to another. Lincoln died 30 years before Rerum Novarum, but his view sounds remarkably like Pope Leo’s. It was just common sense. The problems, not only of the wretched condition of workers, but also those created by the socialist “solution,” were widespread, preying on everyone’s minds, including that of the Vicar of Christ. The aim of Marxist socialism was, and remains, first to destroy all existing society, and later to rebuild it according to socialist principles. The Pope suggests that those who purport to want to represent the workers are being disingenuous; their true purpose is not to improve their lot in the short term, but to bring about complete chaos. He wants to clarify the matter, so that their lies will become more apparent. So he begins with something that everyone can agree on: conditions for most workers in the industrialized world are terrible. The greedy, wealthy few have reduced their workers to being virtually wage-slaves. At the same time, usurious lending practices, long and universally condemned as immoral, have now become quite common, accepted. It’s a perfect storm of badness. But how do you survive the perfect storm? Well, Leo is going to show that it’s not by throwing everyone into the maelstrom, as the socialists would have it. At first glance, socialism’s claim to level the playing field may be attractive — the communists will make an unfair world fair. But, as Leo points out, It wouldn’t be “fair” at all, it would cause more injustice. It would, in fact, violate the basic moral law that one may not use evil means to achieve a good outcome. But it’s not just the means (robbing property owners of their property) that is evil, it’s the end itself — creating a world in which no one owns anything. This is Leo’s biggest point, which he is going to spend some time on. [6-7] And he will make his point by arguing from natural law. This is important, because one does not have to be a religious believer of any kind to recognize the soundness of his argument. And that argument is that it is human nature to make provision for the future — animals don’t do this, only humans do — and the principle means that man uses to provide for his future (and that of his posterity) is to possess the very land he uses to provide for his present needs. This is the very thing that makes a man something more than an animal, in fact it is what makes him human. To deny him the ability to own property is essentially to dehumanize him. (I covered this understanding of human nature in an earlier post on the true nature of human freedom). 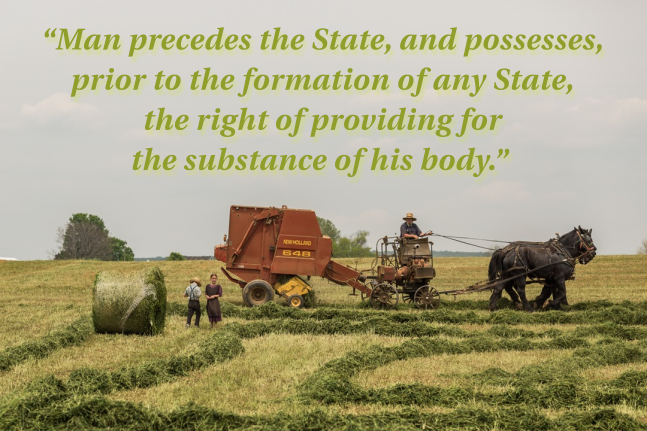 Then he makes, in passing, a point that actually is quite important: a man’s right to provide for himself takes priority — both literally and figuratively — over any right of the State to regulate the disposition of nature’s goods. Literally, man was around, fending for himself, long before there was any “State” to protect him. Morally, also, the individual’s right comes before that of the State. Next, Leo takes a moment to head off a potential objection: “But God gave the earth to all mankind as a whole, not to any particular man.” He points out that even if some people own land and others do not, ultimately, we all live off the land. Some earn their bread directly through their agricultural toil (farmers) and others indirectly, by using their wages (also the fruit of their toil) to purchase the food they need, but the same earth provides for both. So private land ownership doesn’t really deprive anyone. His next point is one that I found very striking when I first read it: when a man works a piece of land to produce something — a crop, a house, whatever — he places his stamp on it, makes it something more than it was, makes the land his own. This is what is meant by “ownership.” It’s not a legal concept at all — it’s a moral concept. And moral law, being immutable, always trumps positive (civil) law. By this point, Leo has made a very convincing argument that it would simply be wrong to deny a man the opportunity to make the land his own (private property), and I would certainly agree, as most readers will, that it’s amazing anyone would deny this. But to lend additional moral authority to his argument, Leo points out that private ownership of property is amply warranted: 1) by natural law, 2) by all (just) civil law, and 3) by Divine Law, citing the commandment against coveting a neighbor’s possessions. God does not forbid private property — quite the contrary, He forbids us to be jealous of those who have private property. By now it should be clear that the socialists with their “outmoded theories” are railing against all dictates of reason, custom, and religion. Because, of course, the socialists preach the exact opposite of Divine Law — they stir up the Have-Nots to make them jealous of the Haves, trying to whip them into rage in which they will rob everyone of any private property. He is not yet done laying the foundation of his argument, based on natural law. In the following section, §12-18 in the Vatican English version, he will go on to discuss the role of the family in society, a topic closely tied to his argument about the individual’s rights. Only after he has done this will he move on to speak specifically about labor relations. I’ll leave my commentary until after his discussion of the family, so in my next post on Rerum Novarum I’ll summarize and analyze §12-18.